No, but may indicate precipitation approach. Cirrus uncinus is a type of cirrus cloud. 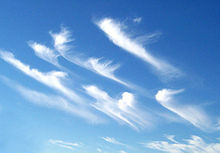 The name cirrus uncinus is derived from Latin, meaning "curly hooks". Also known as mares' tails, these clouds are generally sparse in the sky and very thin. The clouds occur at high altitudes, at a temperature of about −50 to −40 °C (−58 to −40 °F). They are generally seen when a warm or occluded front is approaching. They are very high in the troposphere and generally mean that precipitation, usually rain, is approaching. This page was last edited on 16 June 2017, at 23:46 (UTC).